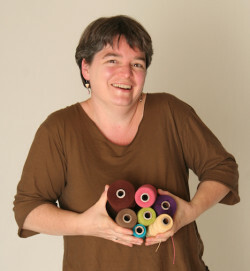 The first time I said to someone, “I make cloth,” something resonated deep inside me. 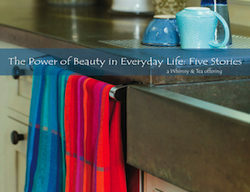 Making cloth is something so basic and yet so profound. Cloth is woven with threads interlacing to create a whole. A life also has various threads and patterns. 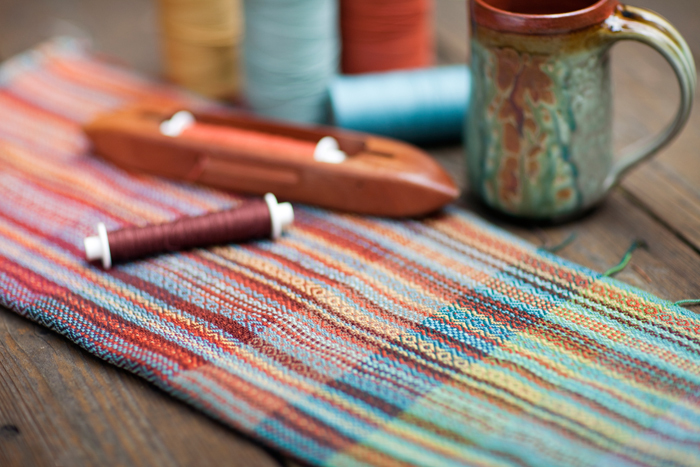 When I learned to weave in 2005, I felt I was coming home. Weaving, and in particular weaving kitchen towels, combines many things that I have loved since I was young. Here are some of those threads. My mother taught my sister and me to knit the summer I turned six. The idea was to give us something to do while waiting in lines at the various sights of London. My interests quickly expanded to include crocheting, embroidery, sewing, and, because it was the 70’s, macramé. I was born and raised in India. I spent thirteen of my first seventeen years surrounded by beautiful, often handmade, textiles — block printed bedspreads, embroidered tea cozies, silk brocade saris, handwoven tablecloths, cotton dhurries, batik wall pieces and so much more. After reading the Little House in the Big Woods series, I wanted to live on a farm rather than the gorgeous foothills of the Himalayas where I went to school. The feminism that I encountered in college in the early 1980’s discouraged my love of the domestic arts and so my dream shifted to becoming a 19th century woman homesteader. From my perspective a 19th century woman homesteader could weave, sew, cook, make cheese, and be considered strong. In addition to home economics, my favorite subjects in school were math and German, in my mind a very patterned language. 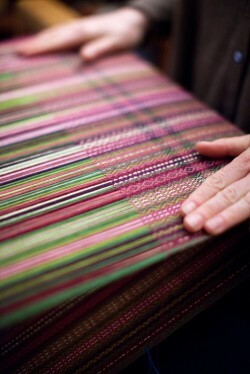 Pattern is a key part of what draws me to weaving. The design process, piecing together the colors, fibers and patterns, is a fun, mathematical puzzle. My first foray into entrepreneurship was in fifth grade. I had a store in the corner of my room. My best selling item was chocolate fudge which I sold primarily to my father and sister, and then reimbursed my mother for the cost of the sugar. I also knit dolls’ sweaters on commission. However, I never sold any probably because I neglected to advertise this service. I love to cook and bake, to prepare food for family and friends. For me, the kitchen is the soul of a house. Growing up, I had tea every afternoon around 3:30pm. When I was in boarding, it was hot chai in plastic glasses in the dining room. When I was at home, it was a pot of black tea poured through a strainer and I added my own milk and sugar. And of course there were sweet or savory treats. I now drink my tea black and not just at 3:30pm. There’s still nothing quite as wonderful as an afternoon cup of tea, especially when accompanied by some handwork. Please feel free to call (413) 369-4713 or email me with any questions.